The Easy Walk® Deluxe Harness is designed to gently discourage dogs from pulling while walking on a lead. 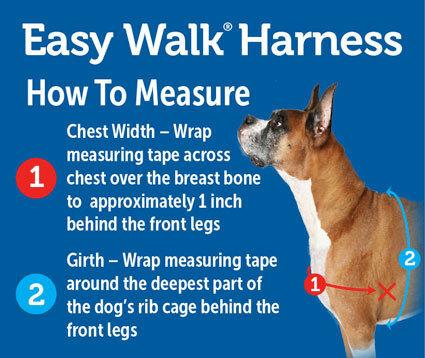 Unlike traditional collars, the Easy Walk® Deluxe Harness does not cause coughing, gagging or choking because the chest strap rests low across the breastbone. I bought the walking harness after trying several other options such as choker and prong collar (which I hated to use) to control our dog when walking on the leash. Nothing worked and she still pulled. I put on the walking harness and immediately she walked along as if she had been in obedience classes for years. I just love this harness and she does too. We walk for kilometres and no more sore arms and shoulders from her pulling. A great purchase! Got two of these for my dogs best investment I have made to date. One got damaged buy dog within first week nice blue one to bad. Did a little repair and seems to be fine for now but will have to be replaced soon. Training is so easy with this thing and both my dogs were night and day right out of the gate. I think this product should come with all puppies to make learning so much easier. Thanks, Shane. > PetSafe Response: Hi Shane, thanks for leaving your review - and for your feedback that this should be an essential product for all puppy training! We appreciate your comments and hope you continue to enjoy walking and training your dogs with our harness.